Home › Hose Nozzle High Pressure Lead Free - Safe For Organic Gardens The Original 9.. Hose Nozzle High Pressure Lead Free - Safe For Organic Gardens The Original 9..
Where most brass nozzles only have 1 or 2 holes at the tip of the nozzle for water flow, the World's Best Hose Nozzle has 4. We engineered 2 extra holes to give you maximum amount of water flow. There is no water-saver or pressure-reducer. You get the full power and thrust from your faucet. The 2 extra holes aid in a more even stream and spray distribution. There are 2 easily replaceable o-rings at the tip. This gives maximum leak-free performance you can only find with a premium nozzle. Included in this set is: a 4" Solid Brass 99.9% Lead-Free Hose Nozzle, 6 Hose Washers, and our Quality Lifetime Customer Support. 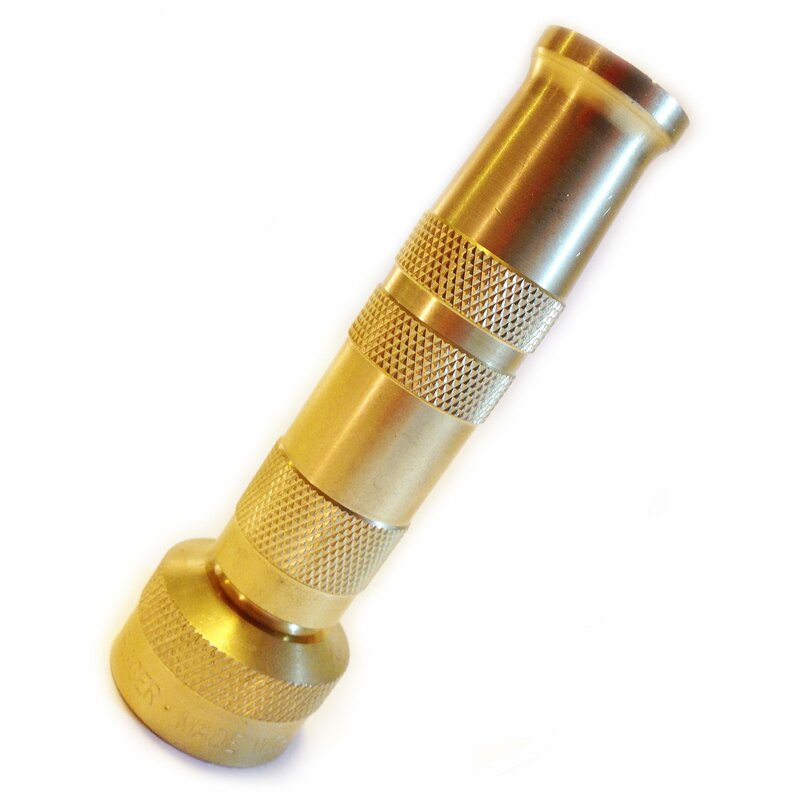 This nozzle is the highest customer satisfaction rated brass hose nozzle. Guaranteed not to leak! Guaranteed to last your lifetime! Your satisfaction is 100% Guaranteed! Guaranteed to Satisfy and Survive! If any of these guarantees are not met, we will happily refund your money or ship you a free replacement. Free amazingly high-yield easy gardening how-to eBook included with your purchase! This practical guide introduces you to the concept of low-hassle, low-maintenance gardening. Once setup, this particular type of garden can produce an abundance of food for your family with as little as 10 hours per year of work! Instructions on how to obtain the eBook are included with the hose nozzle. Nostalgic, old-school craftsmanship. Heavy-duty, easily maintained. Works 100% perfect, from producing a fine mist to a powerful stream. Nothing beats the functionality of this old-fashioned design, especially when they are this quality made and heavy-duty. The range of adjustment from a fine mist to a blasting stream makes this a very versatile nozzle for many applications, including watering your garden or washing your car and driveway. Has consistent flow, fits great, turns smoothly. Any thinking person who wants a quality hose nozzle would want it to neverleak, last a lifetime, and spray evenly without rooster tails or jumbledspots. But if you're a gardener who's also concerned about contaminating yourorganic garden, this is the nozzle for you. 50+ years ago this simple quality and heavy-duty nozzle was largely the onlytype around. Now cheap plastic seems to be the standard. We went on a mission to create the World's Best Lead-Free Solid Brass HoseNozzle. To make your "last-only-one-year-or-less" cheap nozzle hassles begone. This will last your lifetime. It is built as solid as a tank. When it's off, it's off! No leaks! The control is excellent... just a simpleone-handed turn of the nozzle's smooth barrel action changes the spray patternnicely from a wide fine mist or light spray for delicate flowers and plants,to a narrow and full power water jet stream spray great for washing your caror cleaning the sidewalk. Once adjusted to that position, it stays there byitself! To water your garden, set your faucet to medium velocity. Then, set this hosenozzle to a medium spray and enjoy giving that life-sustaining and refreshingwater all over your healthy plants. Since it's made with 99.9% lead-freebrass, you don't have to worry about contaminating your organic vegetables. This hose nozzle is virtually indestructible. It has only solid pieces (noparts "press" fit together). The inner shaft has 4 holes for optimum waterflow. The nozzle can withstand being run over by your car, dropped onconcrete, and just take all the good abuse that quality garden tools canhandle. It may get scuffed, but it's going to still work great. Should dirtget stuck inside it can be easily dismantled and cleaned out. Don't waste any more time or money on nozzles that you'll have to replace nextyear. To buy this nozzle now simply scroll up and click on the "add to cart"button.